Easier operation – The pump location on the outside of the yard ramp frame allows for more convenient access. Faster raise times – Position the ramp up to two and a half times faster than the average ramp. Less wear and tear – Rotation occurs on the redesigned positioning sleeve instead of the ramp connection, reducing wear on the ramp structure. Greater stability – Centrally located cylinder means less chance of tipping. Solid-filled pneumatic tires – Better handle rugged terrain and also reduce the chances of punctures or air pressure problems. Our yard ramp comparison video shows the Coppperloy ramp vs. the competition. See the fastest raise time in action. All Copperloy ramps offer industry-leading strength, outweighing many competitors’ capacities. All Copperloy products are made in the USA. 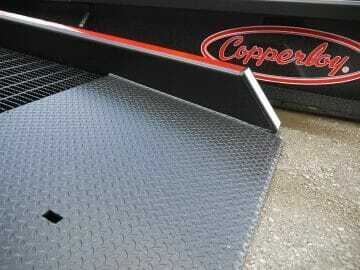 Copperloy mobile ramps have an 8-foot level off feature. This gives forklifts easy access onto trucks, loading docks and platforms. This feature makes for a very stable yard ramp and is especially useful on mobile ramps. The 15-inch lip is designed to firmly rest on the truck carrier body, dock floor or platform. Our mobile ramps come equipped with eight-foot-long safety chains. Chains join the ramp to keep it from pulling away. The single-acting hydraulic hand pump design requires half the effort needed to raise ramp compared to other mobile ramps. The pump is relocated so that it is protected away from dirt, debris, damage and makes maintenance easier to perform. The handle is stored out of the way when not in use. Smooth side plates or curbs are standard. 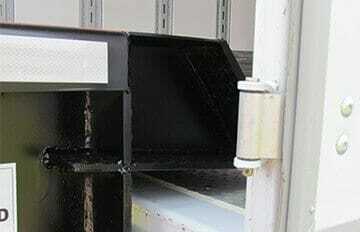 They enclose all working components, while also protecting them from possible damage from other equipment. We designed an end plate that is shorter than the wheelbase of most fork lift trucks. This way, front drive wheels can reach high-traction grating, while rear wheels are still on the ground. The plate comes standard with beveling from the underside. This helps to provide an easy and smooth ground-level entry. 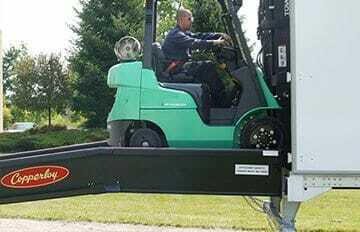 It also eliminates jolts and bumps as the fork lifts travel on and off the yard ramp, with or without a load. High-strength steel is standard on all Copperloy yard ramps. 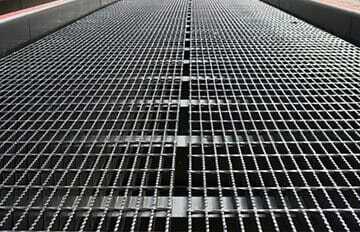 Grating bars are constructed for durability in the roughest of applications. Bars spacing is 1-3/4 inch apart to allow snow, rain, and other debris to fall through. The serrated grating helps to ensure an all-weather, high-traction running surface. 7-inch high curbs are standard on all Copperloy ramps. The side curbs help prevent accidental runoff. The patented box frame. The solid/pneumatic tires are standard on all Copperloy mobile yard ramps and are ideal for all applications. The tires do not require air to fill, are maintenance free, and have lubricated-for-life bearings. The position sleeve allows the ramp to maneuver 180 degrees which reduces loading/unloading time and increases productivity. The fork slides into the positioning sleeve and the ramp can easily be positioned into place. The positioning sleeve is included with all steel mobile yard ramps. The sleeve is not intended for long-distance towing. The towbar is an option on both steel and aluminum mobile yard ramps which attaches to the lower end of the loading ramp. It allows the ramp to be towed a short distance (within your facility). The max towing speed is 5-mph and is not intended for over-the-road towing. Companies can create a dock anywhere with a mobile yard ramp by easily converting open yard space into a portable loading dock. Yard ramps provide a safe, efficient method to load/unload freight with forklifts and access the back of the truck. Yard ramps are a cost-effective way to expand your freight handling capacity. For proper portable yard ramp safety, prior to using it is important to thoroughly review the owners manual. Only trained personnel should operate the ramp. It is extremely important to ensure that the ramp is properly secured before loading and unloading tasks. View the owners manual below for a full overview of instructions and precautions. The yard ramp acts as a portable loading dock ramp and an ideal solution for shipments that need to go from ground level to the truck and a fast method to unload a truck to the ground. Copperloy offers both aluminum ramps and steel ramps depending on your weight and application requirements. Rentals are available and ideal for short-term projects. Copperloy portable steel yard ramps are available in different base materials. However, steel is the standard base for yard ramps. As a leader in custom steel fabrication, Copperloy has mastered the craft of high-strength steel specifications and integrated features such a serrated steel grating for added traction. Manufactured in the USA, steel ramps are built for durability and made to last. Our dock-to-ground yard ramps provide a semi-permanent solution and are typically fixed to the dock for fast, efficient loading/unloading solution handling weights up to 30,000 lbs. Copperloy dock-to-ground ramps can be custom built to the specifications of your dock for a safe, versatile way to expand the capability of your loading dock. Ground-to-truck ramps allow for easy ground level access to semi-trucks. 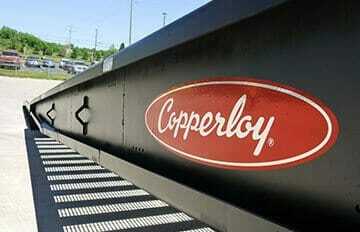 Copperloy ramps allow for maximum safety and productivity when unloading and loading. Designed for industrial use, ramps are available in aluminum or steel based on your material handling requirements. For facilities with limited space or no permanent dock exists, portable loading docks can provide a cost-effective solution for parallel loading when used with dock-to-ground or yard ramps. Copperloy’s portable loading platform feature durable steel construction that can handle capacities up to 60,000 pounds. Their unique design allows lift trucks to easily make right angle turns. Multiple portable loading docks can be connected when larger portable loading docks are required. Choosing the right portable yard ramp depends on how you will be using it. Looking for a permanent loading area or do you require a portable loading ramp? What is the maximum weight that your lift trucks will be transporting? (Don’t forget to include the weight of the lift truck.) Do you require dock-to-ground access or ground-level access to railcars and trucks? Copperloy has been manufacturing yard ramps for over 60 years and our staff is available to consult with you on the best solution for your loading application. If you’re not sure of your future needs, consider a rental yard ramp or a used yard ramp. All Copperloy used ramps are factory certified and guaranteed. Our yard ramps are preferred by dock crews. Copperloy ramps are faster and easier to position than any other ramp on the market. 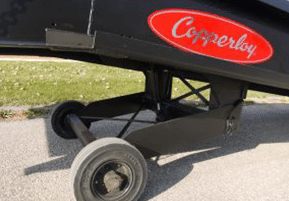 Copperloy yard ramps have been tested and outperformed the other manufacturers including; Bluff Manufacturing, Vestil, Discount Ramps and Handiramp. Click here to watch the yard ramp competition. Copperloy quality is unsurpassed. Manufactured in the USA by experienced machinists, certified welders, and automated robotic cells, our ramps are designed for durability and built to last. What is the difference between a positioning sleeve and towbar? 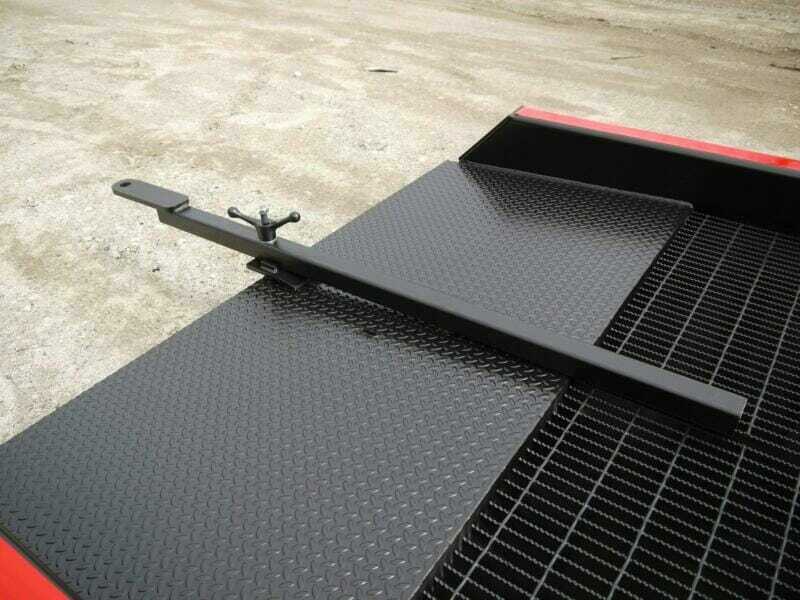 The positioning sleeve comes standard on our steel mobile ramps. It is used to get the ramp into position of the trailer. 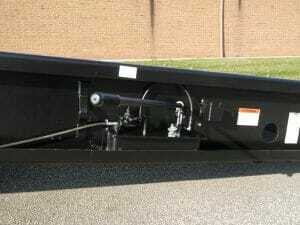 The towbar is used for towing the ramp around your facility short distances (3-5mph max speed). The ramp is not designed for road travel. The standard tires are 18″ solid/pneumatic tires. The tires do not require air to fill, are maintenance free, and have lubricated-for-life bearings. What are the height ranges of the ramps? The standard height range of the mobile yard ramp is 38″-65″. The standard height range for the dock to ground ramp is 38″-60″. We can customize any ramp to unique height requirements. All of our ramps ship with safety chains to secure them. Mobile yards ramps are chained to the trailers. Dock to ground ramps are bolted to the face of the dock with brackets and chains provided. Are rental yard ramps available? Yes. Copperloy has a variety of factory-certified ramps for rent and available for short-term loading dock solutions. Factory certified ramps ensure that all components are in working order and are safe for operation. Improve efficiency and production with a factory-certified dock ramp rental. Copperloy is dedicated to providing customers with as many resources as possible. It is our goal to teach clientele proper safety, operating advice, and more. 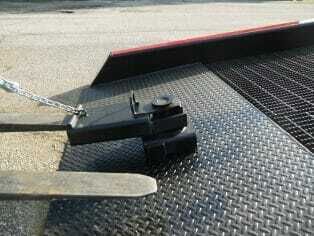 Check out our mobile yard ramp video here and visit us on YouTube for more!